As a few know, I also collect comic books. I also collect comic book art. For me, my real introduction to the GI Joe universe came from the Comic Books and not the toys. I had received a VAMP with Clutch long before I read one of the comics, but it was Hama's comic series that drew me into the Joe Universe. Over the years I have had the opportunity to pick up several pieces of G.I. Joe Comic Book art. I figured I would start a thread to share them with you and hopefully others will post what they have collected. This is NOT a for sale thread as none of my pieces are on the market. I am also throwing in a link to my CAF galleries if you want to see more or comment over there. Again, nothing that I post is for sale either here or in the CAF folder. I currently own six pages with four from the classic Marvel series. The one I smile the most from is the Snake Eyes splash from the GI Joe #155, the final issue. Check them out and post what you have. I am also digging Padilla's pencils on the cover of issue 160 for the revival series. Last edited by Buzzetta; 10-07-2016 at 04:04 AM..
Love old school G.I.Joe comics!!! Met with Larry Hama at the Big Apple show today in NYC and picked up a Snake Eyes sketch. Check it out. While I was there I also asked him to sign a copy of Joe 21 accompanied by a CGC witness. That book was verified and will spend the next couple of months in Sarasota at CGC before it comes back slabbed. Sweet collection. I just started collecting comic art recently. Thanks... I'm looking to pick up a couple of minor pages in a month or two. With the announcement of Valiant properties being developed for movies and other non-comic media, people have been cashing in some of their art. I picked up an Eternal Warrior splash and am waiting on another EW splash along with a double page Turok spread. With the amount of Joe art produced I am surprised that more of it is not available for sale or at least on display, which is why I started the thread. Have a couple of cool things to show off. The next commission was kind of ballsy to ask for I thought but I figured what the heck... it was worth a try. "Mr. Hama, could I get a sketch of Snake Eyes from the cover of issue 21?" The coolest thing was that he liked it so much he took a photo and put it up on his own FB page. Thanks Mr Hama! 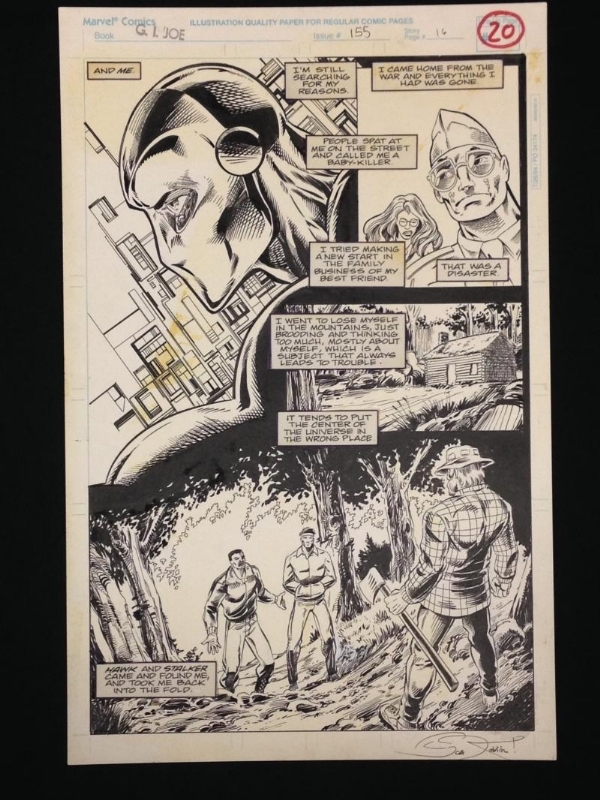 Picked up GI Joe Page 9 from Issue 25 where Snake Eyes learns that the ninja he fought at the Silent Castle in Issue 21 was part of the Arashikage clan.